It’s important to know what apparatus to use when cutting different types of metal. Learn here about cutting tools and 7 great ways on how to cut metal. Are you building something that requires you to cut large pieces of metal? Or are you about to take on a home improvement project that requires metal cutting? Or are you just curious about how to cut metal for intellectual purposes? Whatever the case, we’ve got you covered. Cutting metal might seem like it’s reserved for those with fancy lasers or for superheroes during action sequences, but the truth is you can cut metal yourself many different ways. Keep reading to learn how to cut through metal in 7 different ways. The first, and probably most accessible, is a hacksaw. Hacksaws can cut through almost all kinds of metal. It won’t be the fastest thing in the world (it will actually take a while, especially if you’re cutting through a thick or dense piece of metal), but a hacksaw will definitely get the job done. A circular saw is another respectable option for cutting metal, particularly steel. The caveat here is that you need to fit your circular saw with the proper type of blade to be able to cut through metal. Try fitting your circular saw with a ferrous metal cutting blade (you can find these at almost any hardware store) and cut through any piece of metal as easy as sliding a spoon through Jell-O. You will need to gear up with protective gear: clothes, goggles, headgear, etc. Why? Steaming hot metal pieces will fly everywhere when using a circular saw to cut through metal; you don’t want to get burned by one of those hot chips of metal. You can read more about how waterjets can cut through metal types quickly and easily. However, this is a pretty specialized piece of equipment that the regular ol’ handyman might not own. It’s great, however, for a serious metal worker, industrial applications, or someone looking to up their metal-cutting game. This method won’t really work for thick pieces of metal or metal that’s tougher, like titanium or thick steel. But, it’s a great method for thin metal sheets like sheets of steel, aluminum, or tin. Simply score the sheet with a knife, straight edge, or some other sharp cutter. Then all you have to do is bend the sheet or piece of metal along the score line you made and it will snap right off. This is great for thinner and less tough kinds of metal that require exact cuts along particular lines. It’s common for construction workers like roofers or contractors to use during building projects. Now we’re getting into the cool stuff. A plasma torch, also called a plasma cutter, uses heated gas (aka “plasma”) to cut through materials like metal. It uses what’s referred to as “thermal cuts” which means that the heated stream of gas cuts the metal using thermal heat energy. This type of cutter can cut metal usually only up to 0.25 inches thick since it’s a smaller tool. However, the smaller size doesn’t necessarily mean that this isn’t a high-powered tool. Think about it: a tiny stream of hot gas is going to cut through solid metal as easily as a huge saw can. In fact, this type of torch will do it faster than most saws will. 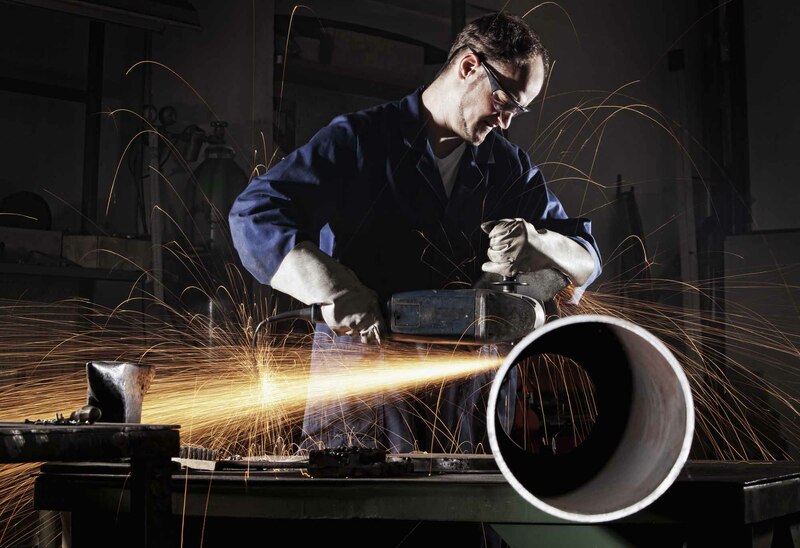 These torches are able to make precise cuts without distorting thin pieces of metal like saws and larger torches can during the cutting process. This type of cutter can be used on any meal. An oxy-acetylene torch should only be used to cut through steel, unlike a plasma torch cutter that can be used on any type of metal. It’s used for thicker steel plates that can’t be cut with a plasma torch because of their thickness. These torch cutters can cut through anything thicker than 0.25 inches but are usually used for plates between 1 and 12 inches. However, they can be used for anything up to 48 inches! Oxy-Acetylene torches are also a type of thermal cutter like plasma torches, except these tools use pressurized oxygen and acetylene gas (as you could’ve guessed from the name of the tool). This tool can be dangerous: high-pressure oxygen used to power the tool can explode, especially if near any type of oil. Acetylene is also a dangerous gas to work with; make sure you’re experienced enough to use this tool safely before using it to cut metal. Taking it from some of the more complex and high powered tools like thermal cutters back to the simple life with tin snips. Tin snips are essentially very large nail clippers that instead of clipping nails clip thin pieces of metal. These are hand powered tools that literally snip the metal where you want. They can be used to cut thin metal sheets, wires, metal mesh, fences, etc. So, there you have it. If you were wondering how to cut metal, you now have 7 different ways to try cutting pieces of metal for your next project. Whether you go old school with tin snips or go for the cool and mind-boggling water jet, your metal cutting needs will be satisfied. Looking for other DIY and tooltips? You can check out our blog section for all sorts of helpful information.